One month after the Haiti earthquake, where are we? The international television units are mostly gone, a smattering of foreign reporters are still in Port-au-Prince, and what’s the situation on the ground? Dire, virtually overwhelmed, hopelessness and helplessness. The Haitian government now estimates that 230,000 people died in the Jan. 12 earthquake. Relief agencies say that they are still only providing immediate relief and haven’t been able to even consider rebuilding and long-term housing. Will things get better any time soon? It’s difficult to know what to say. All along, it has been evident that without a massive effort to start over in Haiti – a Marshall plan-like international operation the likes of which has never been seen – that country will be suffering unbelievable, ineffable horrors. This is not an appeal for money. Many of us have given money. Well-meaning artists have given their energy and their names to raising funds. International organizations are there, the U.S. military has been there. It’s not nearly enough. What can be done? A lot more than naming a commission comprised by former presidents Bill Clinton and George W. Bush to raise money for the rescue. Clinton by the way was in Haiti recently, and someone asked if he would be taking over as the virtual leader of the country. He said it was probably in response to several realities — the Haitian government and the president Rene Preval are hardly visible and hardly leading anything. Second, Clinton has been deeply concerned and even before the earthquake was the special U.S. envoy to the country. (It is not known what Bush has contributed to the rescue effort). And above all, Haitians are looking for rescue, and they don’t trust their institutions, such as they are. She warns against complacency, even against tacit racism directed toward Haiti, by people who say the situation is hopeless. She says that the story must endure, and we must continue to shout out on behalf of the Haitian people. Wilentz wrote last week about a form of “genteel racism” that has set in among some commentators about Haiti, as if there was something wrong with Haitians inherently that relegates them to misery. She rightly decries that attitude. “We need constructive answers….Good ideas are coming in from people like Paul Farmer, who’s run Haiti’s Partners in Health for years and who is now Bill Clinton’s deputy at the United Nations. They’re coming in from Haitian survivors in all rubble-strewn walks of life….people like this are trying to find a way toward rebuilding Haiti, and building it better. How can a person say, “they can help themselves, because they have been given money”? How can you help yourself if you are hurt, that is a blanket statement! You need people to help people, no one including all of us, at one time or another has had help from someone to help us to make it another day. God help us all! This will sort itself out in due time. The logistics must be ample,and correctly thought-out,so as to facillitate such a massive,and daunting undertaking. If we look back at the tsunamies in Thailand,and Indonesian,it actually brought the countries back into the fold,…all people,and political factions fighting prior too,…coming to their senses,and realizing they must become one in order to survive as a whole. 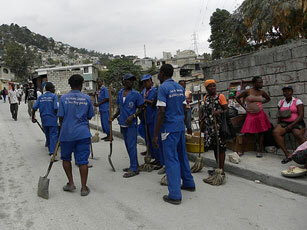 The ultimate threat to Haiti is to have their Gov’t consider a,”Short-Term Freeze” on land sales in Port-au-Prince. What happened in Thailand,and Indonesia was the two-countries weak system of formal land-titles making them easy prey for foreign investors/developers to swoop in,and gobble-up all the prime coastal property,leaving the indigenous ancestry without a prayer for justice having no legal recourse via documentation of actual ownership. I myself see it happening con-currently in Haiti as I write because of the very reason the United States went in,and virtually closed off support by other countries! The NGO’s could care less,for their motives are sincere,but as what happened in Cuba fifty plus years ago, should sound-off the alarm bells. Stay brave Haitian people,the entire world is pulling for you. Please don’t make excuses for a country that cant stand on its own two feet. As, secretary correctly states, they have been given billions and still cant manage there own problem. We can give billions after billions and Haiti will not change. Keep the money here in the United States because I want Social Security when I retire. By the way, if you want to give your money, that’s fine but don’t give my tax dollars. Fact, under Pa Pa Doc, Haiti was in better economic state than any period before or after, maybe they should return to that form of government. Haiti is different. The country was unable to help itself because of massive debt to other countries from mistakes made generations ago. If the debt can be forgiven, with the money Haiti has now, a new beginning is possible. Noreply, if you can’t or won’t give, that’s your decision and no one can fault you for it. The rest of us will continue to help Haiti as we continue to help New Orleans, and Bill Clinton is included in that effort. Just because it doesn’t make the papers doesn’t mean it isn’t happening. Good luck to you. So. That is life. I feed my family first. My hard earn money is for me and my family to stay alive. I have to worry about how cold the house is going to get this winter and how much energy I need to keep it warm. I have to have enough money each monthy for the city water supply, the heating gas company, the telephone, the electric, insurance bills, and a host of other things. Why should I care about the dead in Haiti? Matter of fact why should I care about the living in Haiti. Why should I give to your grief has not Haiti already of the last couple of decades been given billions in dollars and yet was a slum before the earthquake. Every dollar that goes to Haiti has to be borrow from China at a high interest rate. Haiti has found out that the world quickly have lost interest in their problem, it cares little on how many dead (250K) if they are buried or not. News people have got their story and went home since they were in the way. Relief workers from America will also lose interest and go home. Many who were there before the earthquack already have left and will never return. Think about New Orleans that has yet to be put back together again if it will ever be. People lose interest even those Haitians who have come to America will only help their relatives, but will not sell all that they have to help the average Haitians. Do you think that Bill Clinton is going to give away his millions to help Haiti? No he is not. Nor will most Americans since they are likly to be unemployed soon anyway. By the way Chicago USA got hit with an earthquack this morning very small, a few of points higher and Chicago could be or have many times the death rate that Haiti got.